Did you see what I did just there? I don’t have to meet with Caron. I get to. We’ll go to a fancy French cafe and pretend to talk about a conference proposals. We’ll laugh and gossip. It’s work. Of course it is. But it’s also a little fun on my to-do list. I do the same on Sissy and Piper’s chore list. Check out chore number 3. That’s right. Making music is required in our house. Daily. You have a choice, though. Sissy can practice piano, guitar, or flute. She’s a three instrument kind of girl. Piper can play her drums, bongos, tambourine, or sing. Making music is so much more interesting can cleaning out your lunch box or setting the dinner table. Both have to be done, of course, but somehow the not-so-fun becomes more fun when there is a carrot waving in front of your face. Even with the incentive, Piper tries to find creative ways to get out of being told what to do. We have to let something slide. 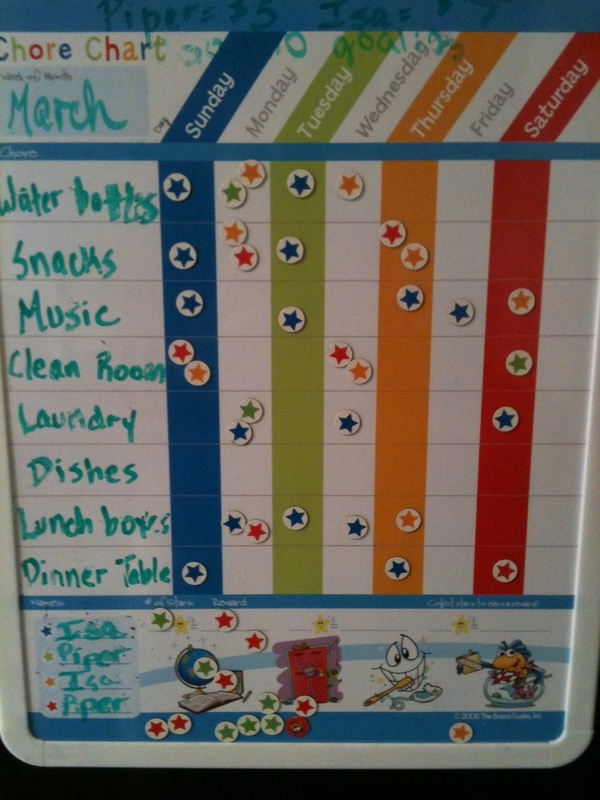 This entry was posted in Antics and Adventures and tagged chores, lists, making music, order, Virgos by melissa.scholes.young. Bookmark the permalink.